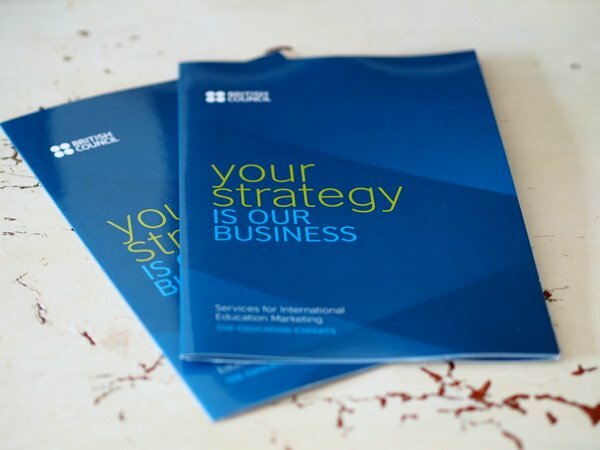 The challenge - to write and produce a glossy, quick-to-digest brochure that introduces the consulting talents of British Council's Services for International Education Marketing (SIEM) team across the globe. A compelling cover message was critical - I felt this slogan captured the right balance of formality and chutzpah, with some elegant wordplay that tweaks just as you read it. 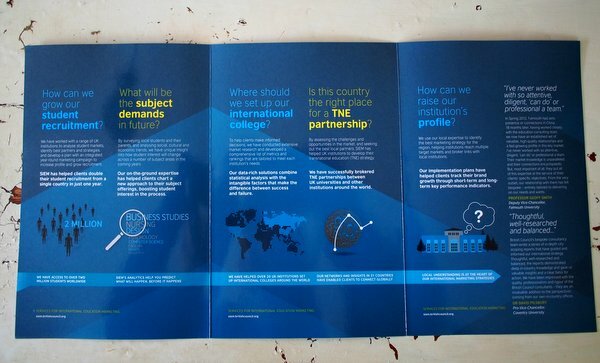 Design is courtesy of the wonderful and ever-inventive Jane, who took British government blue to new heights of royal blueness, and created this really appealing triangular motif background, and some trademark infographics. This gate-fold mechanic added a little extra aesthetic functionality, with the right-hand page linking when folded and the pattern extending with the content when opened fully. Because the consultants are based in different countries we weren't able to organise a photo shoot for portraits, and so ended up with a bit of a hodgepodge of picture styles. The high gloss coated finish was the preference of the client (I suggested a more muted eggshell / vinyl look), but glossy talks in the world of international education marketing. Just so you know. Other work, minor articles, musings and miscellanea.